Ripponden Old Bank remains closed as work is carried out on the blocked culvert. Ripponden residents are counting the cost after floodwater surged through a street in the village leaving a trail of damage and destruction. Fire crews were called to Ripponden Old Bank in the early hours of Tuesday morning, following reports that fast flowing water was cascading from a burst culvert. When they arrived they found three feet of water and submerged cars. The force of the current was so strong that a white Fiat Punto was pushed into the Over the Bridge Guest House, Bridge End, and at one point it was thought that up to five properties would have to be evacuated. The clean-up operation is now underway as residents face thousands of pounds’ worth of damage to their property. Trevor Craven, who owns the Over the Bridge Guest House with his partner, will lose hundreds of pounds over the Easter weekend as two of his guest rooms are now out of action. “I’m gutted about the rooms and for the people who had booked to stay in them, but we’re not closed completely,” Trevor, 54, said. “We cleaned up, we mopped up and did the best that we could do under the circumstances. “We thought everything was ok and we thought we had got off quite luckily, but then I went into one of the bedrooms to change it and the floor was soaking wet. “I checked the other rooms and in two of the rooms the water was coming through the carpet. “We’ve had two dehumidifiers brought down by Ripponden Parish Council, which we really do appreciate, but I am going to have to close two rooms over the Easter period which means I will lose about £600. Trevor was alerted to the flood by a member of staff at the Old Bridge Inn. He said: “I got a call from the manager at the Old Bridge Inn saying ‘look out of your window, cars are moving’. “It was absolutely horrendous. It was just gushing. The noise and sound of it was just awful. It woke our guests up. Bonnie Muscat-Baron’s property was also hit by the flood. “My car and my daughter’s car have both been written off. My daughter is really upset about it as she’s only had her car about three or four weeks,” Bonnie, 49, said. “I have no idea how long it’s going to take to clear. We had washing machines, motorbikes and all sorts downstairs and it’s all ruined. “We’ve been told not to touch anything as we don’t know if it’s contaminated or not. Tim Walker, owner of the Old Bridge Inn pub, raised the alarm when the water began surging down the street. “We started ringing people. Everybody had gone to bed and had no idea what had happened,” Tim, 55, said. Another resident added: “I’d just gone to sleep when the fire brigade knocked on my door. As well as damage to houses, it is thought a wall behind St Bartholomew’s Church collapsed as a result of the flood. 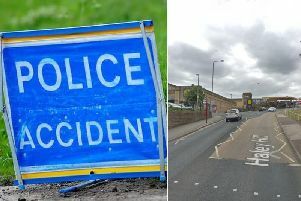 Ian Gray, Calderdale Council’s director of economy and environment, said: “The localised flooding in Ripponden in the early hours of Tuesday morning was due to a significant amount of unexpected heavy rain, which resulted in debris blocking a culvert which then burst into the highway causing significant damage. “Teams from Calderdale Council swung into action straight away and worked throughout the early hours of the morning, providing sandbags and assisting the fire service to try and protect the affected properties as much as possible and ensuring public safety. “Once water levels subsided, council engineers set to work on making the situation safe and cleaning up. Road closures remain in place while authorities work in the area.